The state of Wisconsin signs a deal with a Spanish train manufacturer. Wisconsin will purchase two 14-car passenger trains for $47 million, replacing Hiawatha trains running from Milwaukee to Chicago. 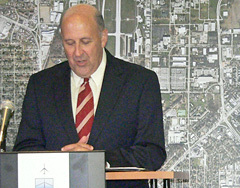 Governor Jim Doyle says this new partnership with Talgo will be good for Wisconsin. Train parts would be manufactured in Spain, but assembled and maintained here in Wisconsin facilities, which Doyle says would initially create about 80 jobs. The contract allows for the option to buy two additional train sets if the state gets money from the federal government&apos;s American Recovery and Reinvestment Act to expand rail service going 110 miles per hour from Milwaukee to Madison, with its ultimate destination being the Twin Cities. Eight-billion dollars in federal stimulus money has been allocated for high-speed rail projects in the U.S. Doyle says this contract makes the passenger rail project shovel-ready and well-positioned to get that federal money. The eventual locations of the assembly and maintenance facilities have not yet been determined, but Talgo has already scouted areas in Janesville and Milwaukee and expect to make a decision within the next six to nine months.